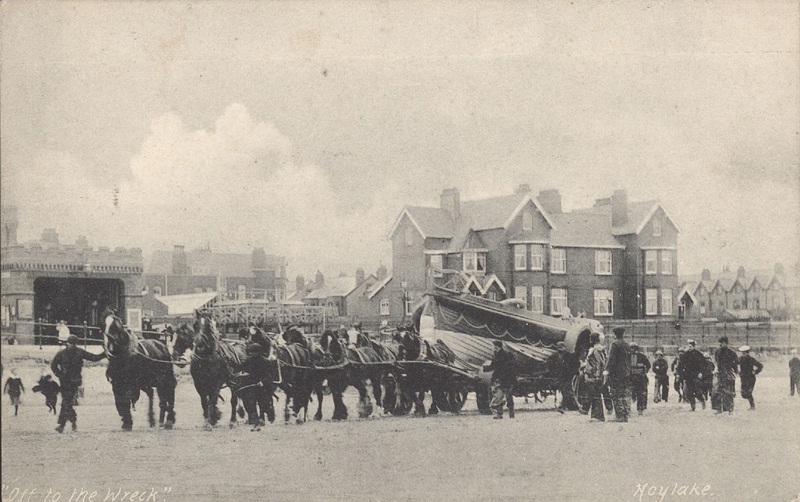 Here’s a good old photo of a Hoylake lifeboat launch that I don’t think I seen before! Entitled “Off to the Wreck”, the horses are ready to pull the lifeboat across the sand for a launch. I can’t seem to make out any crew in the boat mind. Can anyone put a date to this photo? I’m not sure if the perspectives are playing tricks with my eyes – would you agree that the row of terraced houses in the far right of the photo are the backs of houses in Queens Road? Aren’t those houses in Cable Road?